Guam A man is accused of taking what was believed to be a UXO and threatening to throw it during an argument with a woman. Stephen Gregory Hampton, 29, was charged with terrorizing as a third-degree felony, family violence as a misdemeanor and harassment as a petty misdemeanor, according to a magistrate's complaint filed in the Superior Court of Guam states. 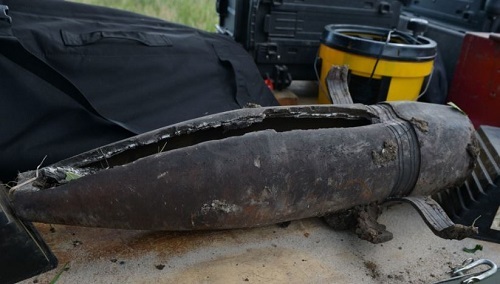 The complaint states that the woman said Hampton retrieved an "unexploded ordnance" and began tossing it up and down and stated "how about I just throw this and blow this (expletive) up." The responding police officer conducted a check of the apartment and confirmed the suspected explosive device was an empty shell casting with no explosive contents. U.S. Embassy Employee, Airport, Luggage, and Munitions? Moscow, Russia a major security alert was made at the Sheremetyevo airport when a U.S. Embassy employee attempted to fly from Russia to Heathrow Airport with a munition in his luggage. The Russian foreign ministry said: "Bomb disposal experts were called in and confirmed that it was indeed a mortar with a detonator, but without an explosive substance although traces were present inside the shell." 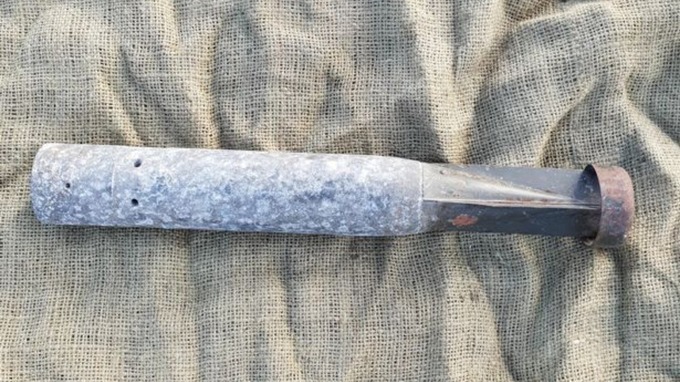 Devon, United Kingdom A student brought an ordnance item to school for 'show and tell' but concerns raised the following day lead to a response by the a Royal Navy EOD team. The item was in the student's house for decades as it once belonged to the student's great grandfather. The student decided to bring in some his great grandfather's war medals and a few items of memorabilia, including the munition, to show the 9 and 10 year old classmates. After the item was brought home, the student's grandfather questioned if item was live. Concerned, he drove the device in the trunk of his car to the Barnstaple police station. The police evacuated the area and called in the Royal Navy EOD team to dispose of the item. EOD disposed of the item in a controlled detonation. A teacher at the school indicated in statement to the press that the school is reviewing its procedures for 'show and tell' In light of the incident. One Soft Taco, One Burrito and One Grenade? Ocala, Florida Police responded to a call of a grenade at a Taco Bell restaurant prompting a response from the local bomb squad. 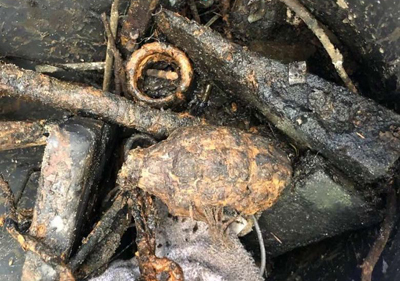 The incident occurred when an unidentified man found the item while magnet fishing in Ocklawaha after which he put the grenade his trunk and drove to Taco Bell before he decided to call 911. Venio, The Netherlands Dutch police warned the public that it is "strictly ill-advised to lie down on a bomb". The incident which lead up this announcement involved a man gardening who uncovered a munition item. After realizing that the item was potentially dangerous, he began to cover the item in sand. In the process, he reportedly heard a whistling sound coming from the item. Concerned, the man decided to lay on the item using his body to cover up the munition. Apparently, he wanted to limit the damage it could cause. When the whistling stopped, the man was so frightened to move that he called police from his cell phone. Police responded and evacuated nearby residents as they called EOD for support  all the while leaving the man perched on the item as they too did not want to take the chance in moving him. Honolulu, Hawaii Artist Kahi Ching found an interesting object in Waikiki which he believed to be a piece of driftwood he could use for an art piece. After bringing it home, a friend suggested that it may indeed be something very different than wood and advised he contact authorities. The artist agreed and called the police. 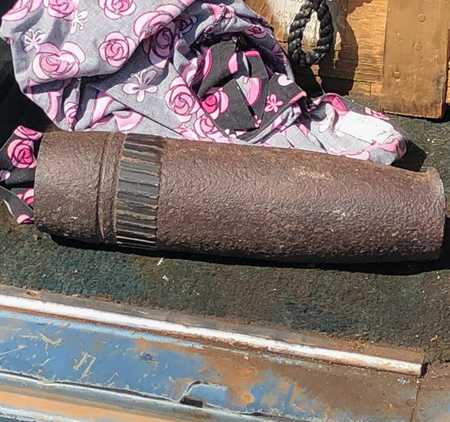 Frederick, Oklahoma Officers at the Tillman County Sheriff's Department called the Fort Sill EOD team to remove an ordnance item from the back of a car. Reportedly the driver brought the round to the Sheriff's office after driving it around for days. The driver told police that he found the round in a ditch and did not think it was dangerous. Leverkusen, Germany A 90-year-old woman caused panic at her local police station when she brought in a live grenade. Unaware that the item was dangerous, she brought it in to ask for help in disposing of what she thought was an old military relic. She was reportedly holding the UXO in her hand explaining that her husband had brought it home as a keepsake from WWII. Following his death, she no longer wanted to display it in her house, where it had sat on a desk for decades. Staff at the station was alarmed and called in the bomb disposal squad. The building was evacuated and traffic cleared while EOD safely deactivated the device. 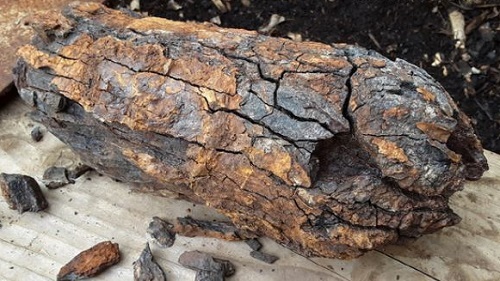 Monchengladbach, Germany A man working in his garden uncovered an old rusty ordnance item. Suspecting it could be dangerous, the man put the bomb in a cardboard box and drove down to his local fire station to ask officials how to dispose of the find. Firefighters called the ordnance disposal service to the site to dispose of the hazard. The ordnance disposal team identified the item as a WWII era British incendiary bomb. The item was safely disposed of through a controlled demolition shot.